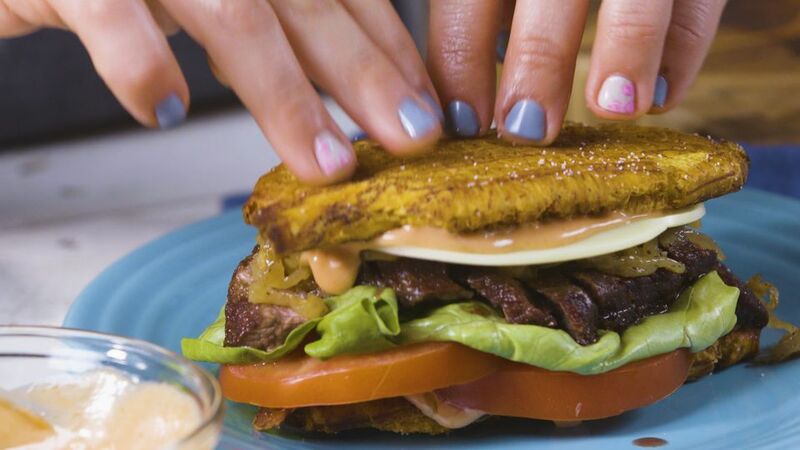 Whether you want a new way to eat tostones or are just trying to shake up steak night, this sandwich is your answer. Tostones (fried green plantains) act as buns to pan-seared skirt steak. A ketchup-mayo sauce adds a creamy, savory-sweet element to the sandwich. Cheese, fresh lettuce and tomato, plus sautéed onions, round out this lively dish. In a small skillet, heat 2 tablespoons of olive oil then saute onions, garlic for 10-20 minutes. Add salt and pepper to taste. In another skillet, heat 1/4 cup olive oil. Peel plantains and cut in half. Fry plantains until golden brown, and remove from heat but reserve frying oil. Using a masher, press down on fried plantains halves until they’re flat and the in the shape of a flat bun. Fry again in oil until crispy. Meanwhile, season steak with salt, pepper and cumin, and cook in a skillet over medium-high heat until cooked through. When steak is almost cooked, place cheese over steak and cover to get melty. Quickly combine a nice hefty squirt of ketchup and mayo in a small bowl and mix until pink. To assemble, dollop the pink sauce on both sides of the plantain bun. Top one bun side w/ lettuce and tomato, then the steak with melted cheese, then a nice spoonful of the cooked onions–probably directly from the pan–and then close w/ the other plantain bun. Turn Lamb Leftovers into a Great Sandwich!